"Will it be four consecutive wins for Great Britain's Jodie Swallow?" 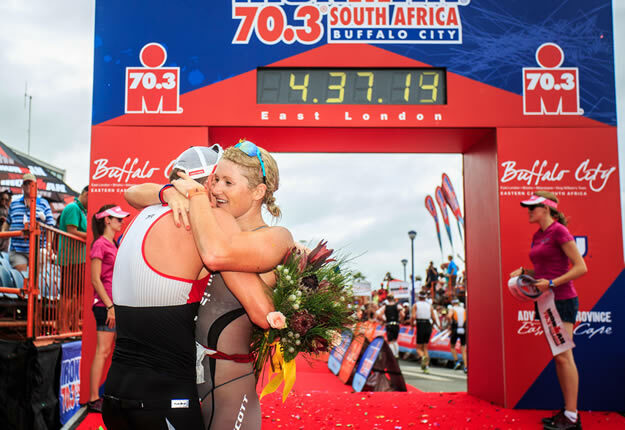 was the opening question in our Pro race preview for Ironman 70.3 South Africa earlier this week. Yes was the conclusive answer, as the former ITU Long Course and Ironman 70.3 World Champ kicked of her year in clinical style. Fastest swim (of course), fastest bike and a strong sub 1:30 half marathon resulted in the typical Swallow race tactic of 'lead from the gun' resulting in her fourth win. It also complete a perfect family result, with boyfriend James Cunnama also taking the men's race. $10,000 each makes it a great start to 2014 for the pair in their first race since leaving TeamTBB in November. Drinks on them tonight! 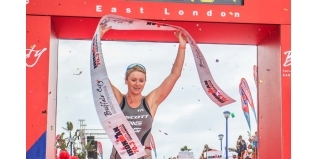 Czech athlete Lucie Reed is practically a 'home' athlete too, as she has lived in South Africa for many year, and she continued her superb run at this race. A winner in 2009, she has raced all seven editions in Buffalo City and second today was her sixth podium finish too over all those years. Much like Swallow, it was a solo day for her too, as she exited the water just over 45 seconds back on Swallow and reamined clear in second all day. Switzerland's Simone Brändli set the fastest female half marathon of the day (1:26:43), but that wasn't enough to threaten the top two as she completed the podium in third place. Great Britain's Susie Huignett, second last year, withdrew earlier in the run.